The High Court (HC) issued a rule on the government to explain within four weeks why freedom fighters of liberation war of 1971 would not be entitled to a special division in the prison and jails of the country. The rule came following a writ petition filed by a veteran freedom fighter and retired government teacher Aminul Haque Bhuiyan, son of late Abdul Hakim Bhuiyan from Feni district. Counsel for the petitioner advocate Fawzia Karim Firoze argued in the court that the state has given different honors and recognitions to the freedom fighters in different sectors. However freedom fighters have still not been included in the "Division Category" of the present jail code of the country. Aminul filed the petition on November 11 last. After a hearing on the petition, a HC division bench comprising Justice Syed Mahmud Hossain and Justice Farid Ahmed issued the rule. Respondents of the rule are Principal Secretary to the Chief Adviser, Cabinet Secretary, Home Secretary, Secretary of Liberation War Ministry and Chairman of the Central Command Council of Muktijoddha Shangshad. Aminul, a retired Assistant Headmaster of a government school in Dhaka said in his petition," Persons in the categories of VIP, CIP, MP and other social gradations are treated with dignity and respect in the jail for any category of offences." But freedom fighters involved in similar categories of offences are not treated with similar privileges which is contradictory to the recognitions freedom fighters they are entitled to now, the petition added. 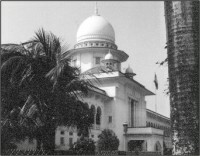 Aminul demanded in his petition "that freedom fighters of Bangladesh need to be treated with dignity and respect in every quarter and as such they need to be given a 'Division' in prisons and jails as well." Advocate Fawzia argued that the government could introduce a provision for freedom fighters to get division in jail through issuing a notification as well as including this provision in the jail code. Petitioner Aminul was forced to retire from his job by the former BNP led alliance government for protesting against illegal enlistment of voters. He came into limelight after making public the inclusion of 900 fake voters in the Agargaon voter list under Dhaka. Referring to the glorious contribution and sacrifices of the freedom fighters during the liberation war in 1971, Aminul said in his petition that freedom fighters are also part of the society and community. For this reason they may also sometimes get involved in different incidents that can render them accused or convicts in different offences and cases. While freedom fighters are being detained in different jails, they are treated as common convicts. On the other hand for similar offences mps, cips, vips and privileged persons are entitled top division in jails and prisons. Aminul in his petition that this attitude and practice show the non-recognition of the contribution of freedom fighters who brought us "freedom from oppression and dictatorship".